Veerendra Raj Mehta is a former senior civil servant who worked for Government of India in New Delhi and the Asian Development Bank in Manila. He has been closely associated with Mother Teresa's social and humanitarian work and also worked in providing relief to victims of the Gujarat earthquake. He has also been closely associated in India and abroad with the work of free fitment of artificial limbs known as Jaipur Foot. He is the founder President of Mahaveer Philippines Foundation in Manila for fitment of Jaipur foot in the Philippines and was a member of the team that visited Kabul in Afghanistan for fitting Jaipur Foot to war victims there. In 1993, the City of Manila honoured him for his humanitarian work in the Phillippines. It accorded him the rare honour of adopting him as the "Son of Manila" and presenting him with the 'Key of the City of Manila'. Vimla Mehta is a prolific writer in Hindi. Since 1970, she has authored 13 books and numerous articles. During their stay in Manila both her husband and she were intimately associated with Mother Teresa's work in the Philippines. She is the founder Director of Mahaveer Philippines Foundation in Manila for free fitment of Jaipur foot in the Philippines. In 1993, the City of Manila honoured her for her humanitarian work in the Philippines. It accorded her the rare honour of adopting her as the "Daughter of Manila" and presenting her with the 'Key of the City of Manila'. Mother Teresa’s life was a sage of care, service and love and her area of work had spread even in her lifetime, to all corners of the world. Her reserves of compassion never dried up. Her work among the dying and terminally ill was something unique. The distinctive blue bordered, cotton saree of the Missionaries of Charity is today universally recognized as a harbinger of love and? Has become synonymous with care and comfort of the poorest of the poor. During our fourteen-year sojourn in Manila, my wife Vimla and I were fortunate to get numerous opportunities to participate in different service activities initiated by Mother. In 1987, we had a godsend of an opportunity to work very closely with Mother when she stayed in Manila for a whole three weeks. During this period both my wife and I remained continuously associated with her different activities. We were spell bound and attracted by her remark? It was during this time that we established an unbreakable bond with her. We would discuss matters concerning the daily routine of Homes and also about the welfare? Of Sisters. At one time, Mother sent my wife and me to her Olangapo Home and later to her Hongkong Home. At another time, she also directed us to meet. The then President of Philippines Corazon Aquino to secure exemption from custom duty for the medicines received as gifts from foreign countries for treating inmates at her various Homes. Some people accuse Mother of religious bigotry but this is from true. Can embracing and taking care of the unwanted, the unloved, the crippled and the detested destitutes ever be equated with any single religion? Can there be any religious name for selfless and compassionate humanitarian work amidst the squalour, filth and stench of the poor, sick and dying? Her humanitarian work had in fact transcended all faiths and religions. Spirit of service was her main source of strength as well as energy. Her empire of humanitarian service has grown by leaps and bounds. It now resembles a mini United Nations of 121 countries! 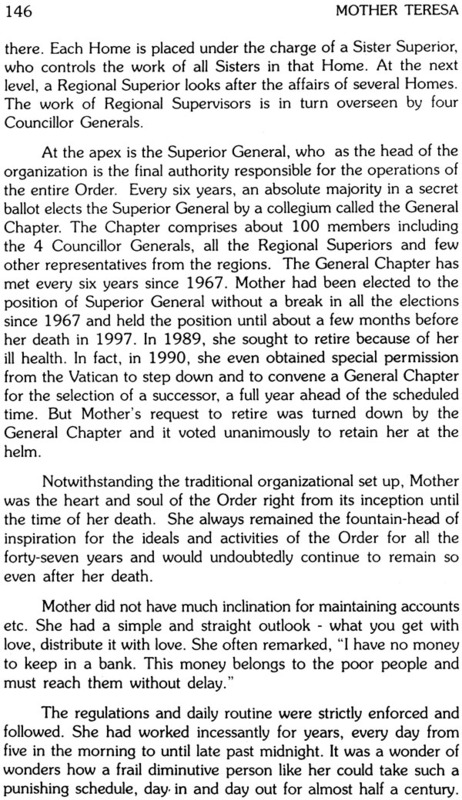 She was not only its organizational head but also its heart and soul for a full 47 years.
" .... The loneliest, the most wretched and the dying has at her hands received compassion without condescension based on reverence for man." President Giri of India summed up her life thus: "She is a woman of God who embodies Christian love. In action her humanism is the highest form of religion, the light that never fails.” ‘Prime Minister Indira Gandhi, an ardent admirer of Mother’s work once remarked, “To meet her is to feel utterly humble, to sense the power of tenderness, the strength of love." The stirring life and events and incidents of dedication with which Mother Teresa provided love, comfort and care to the despised, the sick and dying and the poor are all matters of great inspiration for the young ebullient teen—aged boys and girls. The book as a collection of many separate interesting and inspiring incidents and episodes from Mothers life, including many from the authors’ own experiences, is an attempt to target the young, youthful and impressionable audience. 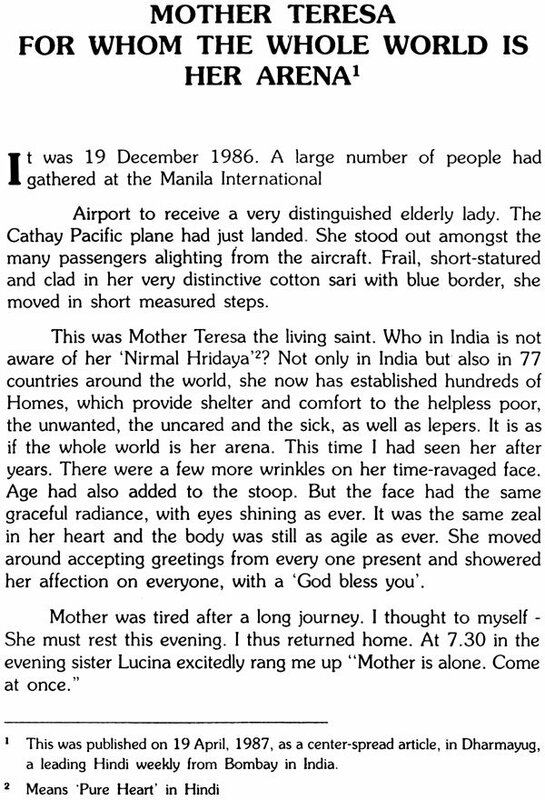 We have pleasure in now presenting to our readers the English edition titled “Mother Teresa — Inspiring incidents". In translating the book, every effort has been made to retain the spirit and poignancy of the incidents in the Hindi edition. The opportunity has also been used to update the book with more recent events such as the fastest ever Papal decision to beatify Mother Teresa. Similarly, opportunity has also been availed to correct the few errors that had crept in the original edition. My wife and I were together in our association with the humanitarian activities of Mother in India and abroad. Mother would also mostly assign special tasks to both of us together. It is therefore fitting and appropriate that just as we both wrote the book together, she has also been constantly advising me in this translation as well. The old city names of Calcutta and Bombay have been changed in this edition to their new official names of Kolkata and Mumbai respectively. We hope that this new edition will further enlarge the book’s readership among adults while still retaining its usefulness and relevance for the target readership of the young audience. It is also a happy coincidence that the new English edition of the book is going to the press at a time when Mother Teresa has just been “Beatified" by Pope John Paul II. Our thanks are due to D N Gandhi, Joint Director, Smt. Shalini Narayanan, Editor, and Shri S. Mahesh, Assistant Editor, Publications Division, Government of India for their assistance in bringing out this beautiful new edition. Our thanks are also due to Shri P.N. Dwivedi for his help in the translation work. We are happy to reiterate our abiding thanks to the world famous painter and artist Shri M.F. Husain who gifted us one of his beautiful paintings of Mother for use on the cover of the book and the renowned photographer Shri Raghu Rai who too gifted us one of his striking pictures of Mother. On the occasion of publication of this book we again respectfully bow to our highly revered Jain Muni Hastimalji Maharajsa, our late Acharya, who had always taught us the lessons of ahimsa, compassion and service. Mother Teresa’s humanitarian work for the unwanted, the unloved, the dying and terminally ill and the poor is legendry. It is well known all over the world. Her achievements and honours are unlimited. During her lifetime and even after her death, hundreds of books have been written about her noble work. Then why one more book? Mother’s whole life is full of a whole lot of stirring events and incidents of the dedication. She provided love, comfort and care to the despised, the sick and dying and the poor persons. Her trail blazing efforts provided dignity even to the poorest of the poor and upheld their self respect. These are all matters of great inspiration for the young teen-aged boys and girls. Yet perhaps there is hardly any book about Mother Teresa in India or elsewhere that is specially written to specifically target this young, youthful and impressionable audience. This book as a collection of many separate interesting and inspiring incidents and episodes from Mother’s life, including many from the authors’ own experiences, is an attempt to fill this gap. In 1987, I was commissioned by The National Council for Education Research and Training (N.C.E.R.T) in India to write Mother’s biography. I had already completed a major part of the job. As I was anxious to know even more about Mother’s life including her childhood, I undertook a trip from Manila to Calcutta. I spent a number of days there with Mother trying to gather some more intimate details of her life. One day Mother abruptly Said, will not be appropriate to write my biography while I am alive. Even biography of Jesus was not written during his lifetime — I am a mere mortal!”. All my enthusiasm evaporated. My deep veneration for Mother compelled me to break the contract with NCERT. I was however fortunate in continuing to enjoy Mother’s affection. For the next ten years, I was witness to openings of several of her new Homes in Manila. 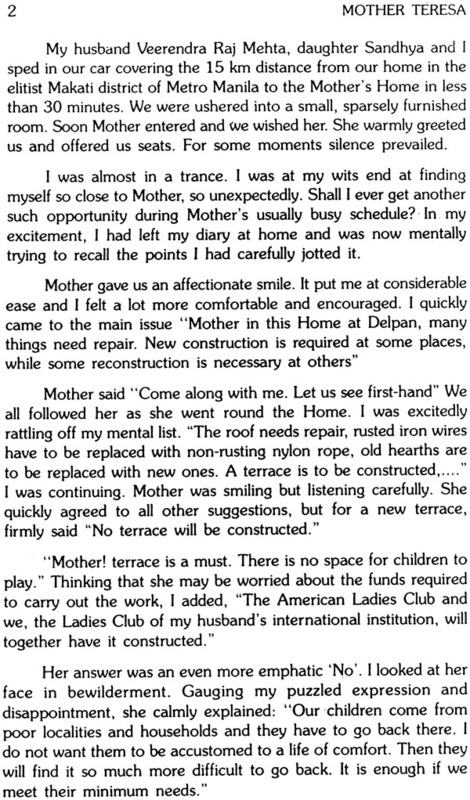 It is only after Mother has left for her heavenly abode that I recommenced work on Mother’s biography, pulling out some touching and moving gems of incidents from the depths of my memory. It was also convenient to be in Manila where I could easily access the Ramon Magsaysay Foundation and the wealth of material they have on Mother. I was lucky to have been associated with Mother since 1975. That was the International Year of Women”. The Hindi magazine ‘Saptahik Hindustan’ was every week publishing a series of my articles on Women in Fields Considered Exclusive Preserves of Men. 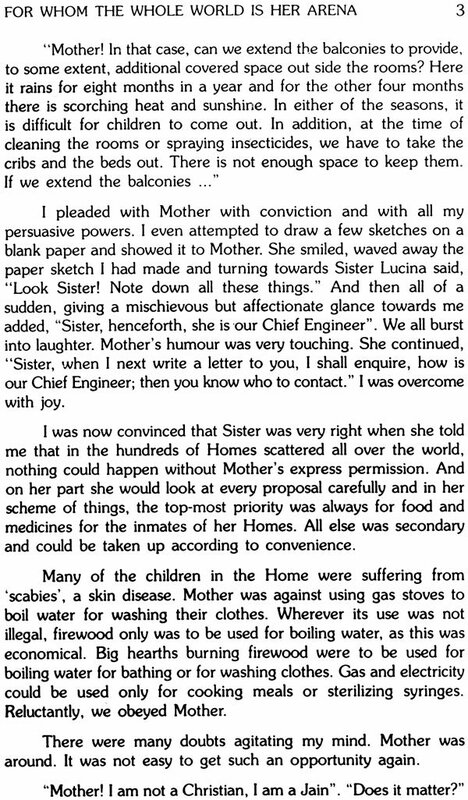 For the purpose, I was assigned to interview Mother at her Home at 12 Commissioner Lane in Delhi. This was my first face to—face meeting with her. This was followed in quick succession by my visits to her ‘Nirmal Hriday’ Home in Calcutta and then to her many Homes in Manila in Philippines and several other countries. It very quickly transformed the initial formal and hesitant acquaintance to closeness. My first interview with Mother in Delhi was published in ‘Saptahik Hindustan’ and later included in my book titled ‘Aaj Ki Mahilayen’ (Women of Today) published in 1975. The article on Mother was later included as a Chapter in one of the textbooks published by N.C.E.R.T. for school children. During our fourteen-year sojourn in Manila, my husband Veerendra Raj Mehta and I were fortunate to get numerous opportunities to participate in different service activities initiated by Mother. Even when l would be making my usual three or four annual visits to India, I was always drawn to Mother by some kind of an inner urge. 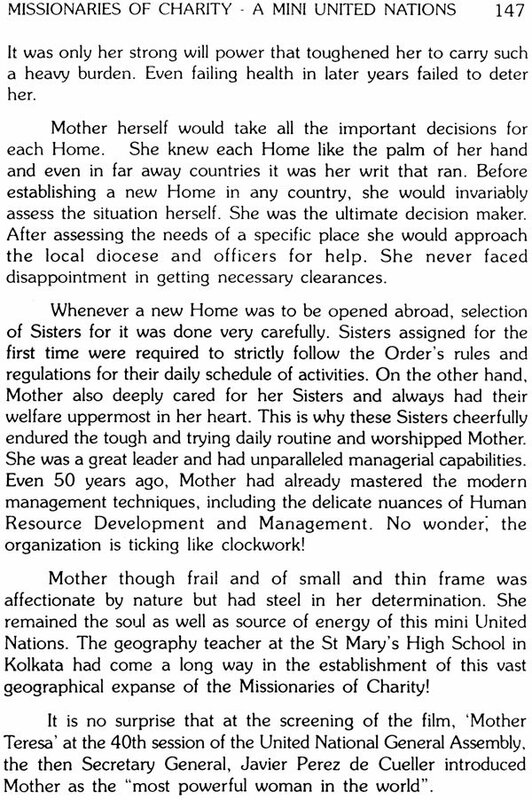 In 1987, we had a godsend of an opportunity to work closely with Mother when she stayed in Manila for a whole three weeks. During this period both my husband and I remained continuously associated with her different activities. We were spell bound and attracted by her work. It was during this time that we established an unbreakable bond with her. We would discuss matters concerning the daily routine of Homes and also about the welfare of Sisters. At one time, Mother sent my husband and me to her Olangapo Home and at another time to her Hongkong Home. She also directed us to meet the then President of Philippines Corazon Aquino to secure exemption from custom duty for the medicines received as gifts from foreign countries, for treating inmates at her various Homes. 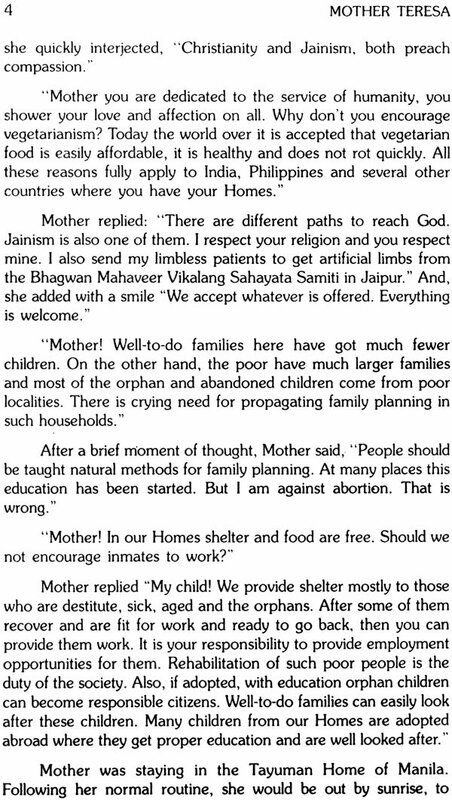 A highlight of this period was a long interview for Dharmayug (A well reputed national weekly publication in Hindi) that we both, along with our daughter Sandhya, had with Mother; it was published as a center—spread article in Dharmayug’s issue of 19 April 1987. Some people accuse Mother of religious bigotry but this is far from true. 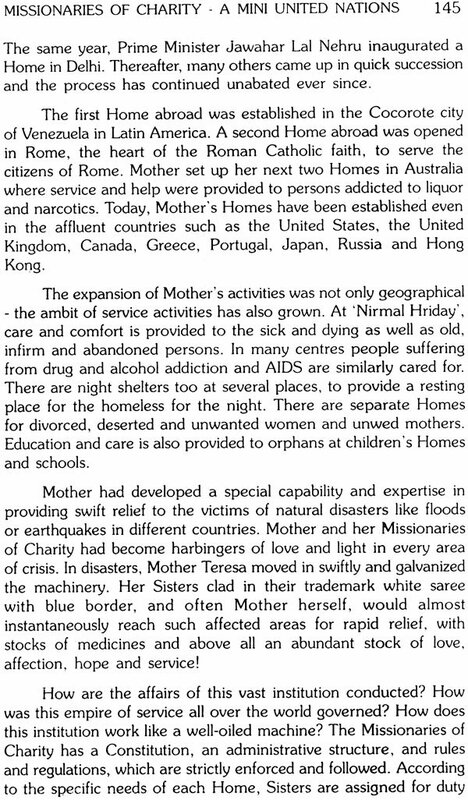 Mother encouraged humanitarian activities in any form. The Jaipur-based ‘Bhagwan Mahaveer Vikalang Sahayata Samiti, a charitable organization for helping the disabled and engaged in free fitting of the world renowned ‘Jaipur Foot’ to amputees is an example. Mother always appreciated the Samiti’s service to the disabled and regularly referred disabled persons to it for fitment of artificial limbs. In addition, whenever she came to Jaipur, she made every effort to visit the limb centre. During her stay at Manila in 1987, displaying her religious tolerance she introduced me to the then President Aquino of Philippines (popularly known as Cory) saying, "Look Cory, this is Vimla. She is a Jain but she willingly works for my Homes." For her, service was religion. It did not matter to her one bit that I belonged to another faith or religion. Can embracing and taking care of the unwanted, the unloved, the crippled and the detested destitutes ever be synonymous with any single religion? Can there be any religious name for selfless and compassionate humanitarian work amidst squalour, filth and stench of the poor, sick and dying? Had her humanitarian work not transcended all faiths and religions? Spirit of service was her main source of strength as well as energy. It was really a miracle only of her deep inner conviction and motivation that the frail looking Mother could transform herself into a human dynamo totally dedicated to service. Her empire of humanitarian service has grown by leaps and bounds. 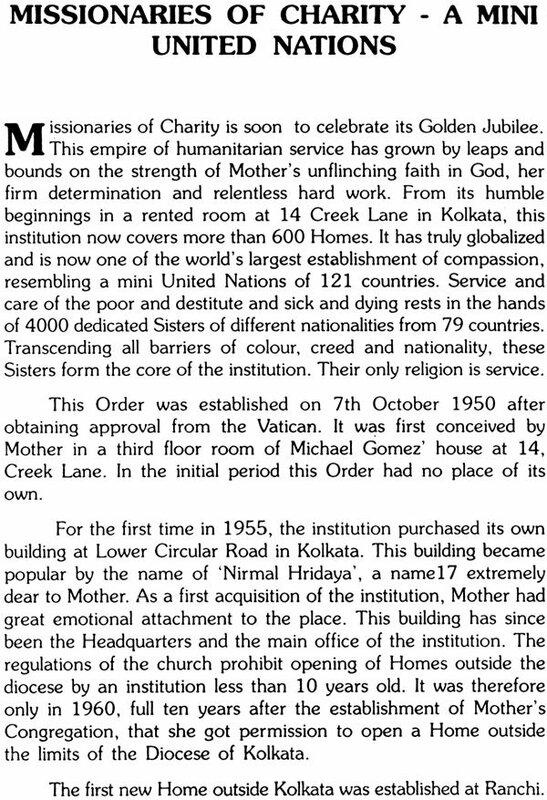 From its humble beginnings in a rented room at 14 Creek Lane in Calcutta, this institution now covers more than 600 Homes. It now resembles a mini United Nations of 121 countries! She remained its head as well as heart and soul for a full 47 years. My husband and I were together in our association with the humanitarian activities of Mother in India and abroad. Mother would also mostly assign special tasks together to my husband and me. It is therefore fitting and appropriate that we have both written this book together. In the book in relating several personal incidents, the names of some of the characters and locations have been changed to protect their identity and privacy. In response to our special request, the world famous painter and artist M.F. Husain gifted us one of his paintings of, Mother. The renowned photographer Raghu Rai too gifted us one of his beautiful pictures of Mother. Both have immensely added to the quality and beauty of this book. We are really beholden to them. Our three children Shailendra, Sandhya and Neena have been sources of constant inspiration to us in writing this book Himself deeply involved in service of the disabled and disadvantaged, my husband’s younger brother Devendra Raj. Mehta also gave us continuous inspiration. From the Publications Division, Vasudha Gupta and Rajendra Bhatt extended their full co—operation in editing the book. We are grateful to all of them,. Highly revered Jain Muni Hastimalji Maharajsa, our late Acharya, had always taught us the lessons of Ahimsa, compassion and service. On the occasion of publication of this book we, along with our family, respectfully bow to him.